two peas & the dog: food. 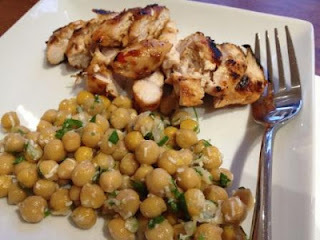 sweet chili + lime chicken, chickpea salad. 1. Mix sweet chilli sauce, lime juice, and olive oil together in a small bowl. 2. Pour mixture over chicken (in a zip lock or tupperware). 3. Let marinate for a minimum of 30 minutes. 4. Barbecue over medium-high heat until cooked through.